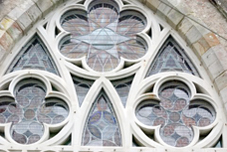 Protection of stained glass windows against vandalism and the environment is essential. The most appropriate method of protection should be employed taking into consideration window design, architecture and the level of protection required. These guards are manufactured from stainless steel wire. Great care is taken in order that each guard fits accurately ensuring that the appearance of the stonework is not compromised in any way. Once manufactured the guards are then matt black powder coated giving the material a pleasing, dark, non reflective finish that blends well with the stained glass and the overall architecture. In contrast to wire guards, storm glazing gives protection against the elements. We use only safety glass for this purpose, the specification of which is dependent on the circumstances. We ensure that adequate ventilation is provided top and bottom to prevent a build up of heat, condensation and consequent biological growth within the interspace.